Listen to some of the best cowboy poets and storytellers around spin tall tales, admire the colorful stones from across the Big Bend region, and take yourself out to an Alpine Cowboys baseball game. 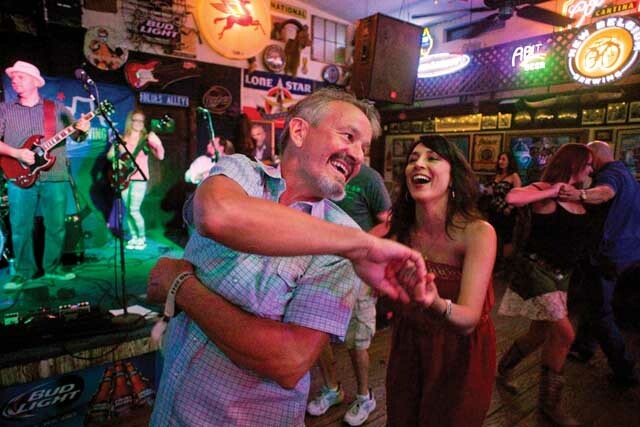 These are a few of the ways you can enjoy all the events in Alpine, a bustling small town located among the mountains of West Texas. Read on to see many of Alpine’s top festivals so you don’t miss out while you’re here. A herd of cowboy poets, songwriters, and wordsmiths rounds up in Alpine every year for the Texas Cowboy Poetry Gathering. Held on the campus of Sul Ross State University, the more than 30-year-old event kicks off each day with a chuck wagon breakfast at Poet’s Grove in Kokernot Park. Tickets are available at the Gathering headquarters in the University Center. The Big Bend is a playground for rock hunters who seek out its abundance of agate, jasper, quartz, and other colorful stones. Many of these are on display at the annual Alpine Gem & Mineral Show, a three-day event at the Alpine Civic Center where you can admire the displays and shop for beads, jewelry, and rocks. Get into a festive mood with Alpine’s own Cinco de Mayo celebration featuring a parade, car show, mariachi performances, ballet folklorico, and lots of food, games, and things to shop for. Browse and shop a stunning gallery of traditional Western art and custom-made cowboy gear at this event in Alpine. Held for more than a month at the Museum of the Big Bend, it’s the longest-running event of its kind in the country. Watch independent baseball at its finest when you catch an Alpine Cowboys game played at the historic Kokernot Field. From May through July, the Cowboys compete against the rest of the Pecos League for the championship, which they last won in 2012. Take in a show and a spectacular view of the Davis and Glass Mountains during the Theatre of the Big Bend’s summer season. Past shows at the outdoor theater include Alfred Hitchcock’s The 39 Steps, The Fantasticks, and Little Shop of Horrors. Alpine’s annual Independence Day festivities include a patriotic parade, live music, and a breathtaking fireworks show. Much like the Lone Star State, the Viva Big Bend Music Festival is a big deal. Showcasing the talents of dozens of performers from across the country, it’s no wonder this four-day festival is held at venues in Alpine, Fort Davis, Marfa, and Marathon. Tickets are available on the event’s website. Watch some of the top working cowboys face off in the Big Bend Ranch Rodeo, an event sanctioned by the Working Ranch Cowboy Association. Main events include ranch bronc riding, team sorting, team branding, team doctoring, wild cow milking, and popular children's competitions like mutton bustin' and the boot scramble. A cutting horse, ranch horse, and youth competition at o6 Ranch is also part of the fun. A parade followed by a day-long fiesta with live music, great food, and tons of ballet folklorico is how Alpine celebrates Mexico’s Independence Day. Some of world’s fittest and most determined athletes take on the ultimate Big Bend challenge: the 163-mile-long Trans-Pecos Ultra. Combining hiking and endurance running, the race meanders through the beautiful Big Bend Ranch State Park on a path that has more than 15,000 feet of elevation gain. Get up close and personal with the falcons, hawks, eagles, owls, and vultures that call Big Bend home during this two-day event at the Historic Kokernot Lodge. The largest art festival in town showcases exhibits in many local businesses throughout downtown Alpine. In the late afternoon and evening hours, take in live music performances at locations all over the downtown area. Kick off the holiday season in Alpine with the colorful Parade of Lights that weaves through the downtown area. Enjoy the music, downtown hayrides, starlight shopping at local boutiques and galleries, and don’t miss the lighting of the Community Christmas Tree on the Brewster County Courthouse lawn.